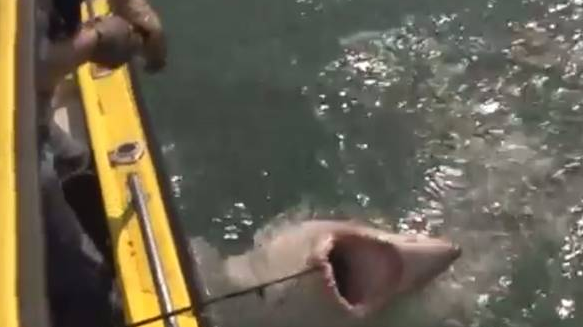 A VETERAN British angler has released extraordinary footage of the moment he single-handedly caught an eight-foot, 450lb (204kg) shark just one mile from a popular Devon beach. Graeme Pullen, 62, was fishing for pollock with his friend Wayne Comben when the giant porbeagle shark bit, starting a 30-minute battle to reel it in. Video footage uploaded to YouTube by Totally Awesome Fishing showed Mr Pullen leaning far back into the boat in his fight with the fish, and at one point he looks at risk of being pulled overboard as his hands get caught up in line. Eventually the porbeagle tires out, making it safer for the angler to bring it alongside the tiny 17ft dinghy. Totally Awesome Fishing said on its Facebook page that the shark was likely to be a record for a single-handed catch - and it comes almost exactly two years after Mr Pullen and Mr Comben, in the same boat, caught a 550lb porbeagle that experts believe to be the biggest ever off British waters. The giant shark The team said it was the "first big shark of the 2014 season", and the fact that it has come so early suggests it could be a bumper year for sharks off the UK coast. 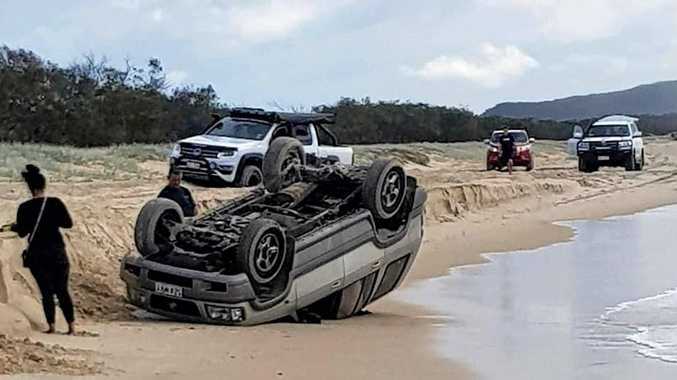 Mr Pullen said the shark was landed in "a newly found hotspot", but reportedly refused to identify the location precisely for fear of upsetting local tourism bosses. The shark is reeled in to be tagged Swimmers on the north Devon coast need not be overly concerned, however. The porbeagle belongs to the Lamnidae family of sharks, commonly known as mackerel or white sharks and which includes the great white. Yet despite that fearsome association - and its menacing appearance - the porbeagle is not considered to be a threat to people. Richard Harrington, of the Marine Conservation Society, told the North Devon Gazette that it was not likely to attack people bathing on the beaches. "It has a diet mainly of fish such as mackerel and cod, and tends to be found well out to sea," he said. The video footage showed Mr Pullen legally tagging the dorsal fin of the shark before preparing to set it free, and Mr Harrington said: "We are pleased to see the fish returned alive, as sharks and rays of many species are classed as threatened or endangered. "The porbeagle is considered critically endangered in the North East Atlantic," he added. Totally Awesome Fishing said the full video of Mr Pullen's extraordinary catch would feature in the next episode of its weekly show, to be posted on YouTube this Friday.